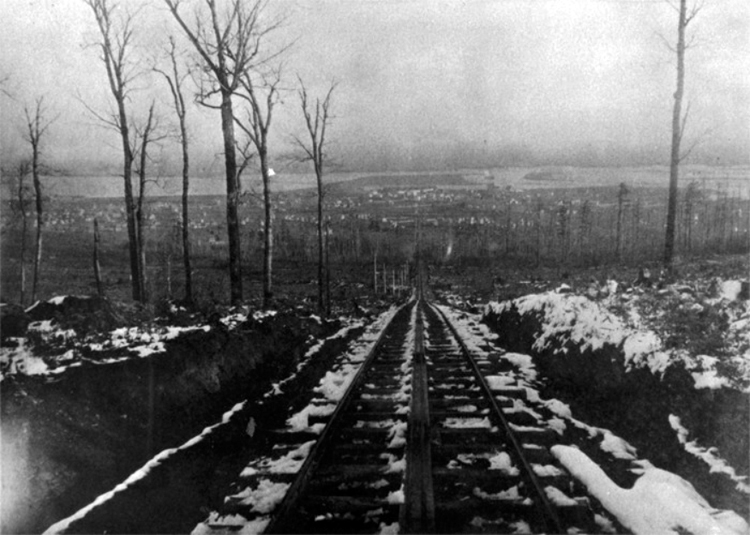 Much like the Seventh Avenue West Incline, the Duluth Beltline Railway was built to help a developing neighborhood. First operated in 1889, the “West Duluth Incline” or “Bay View Incline” as it came to be known, ran from a station at Sixty-First Avenue West and Grand Avenue up to the newly developing neighborhood of Bayview Heights at Vinland Street and Seventy-Seventh Avenue West. 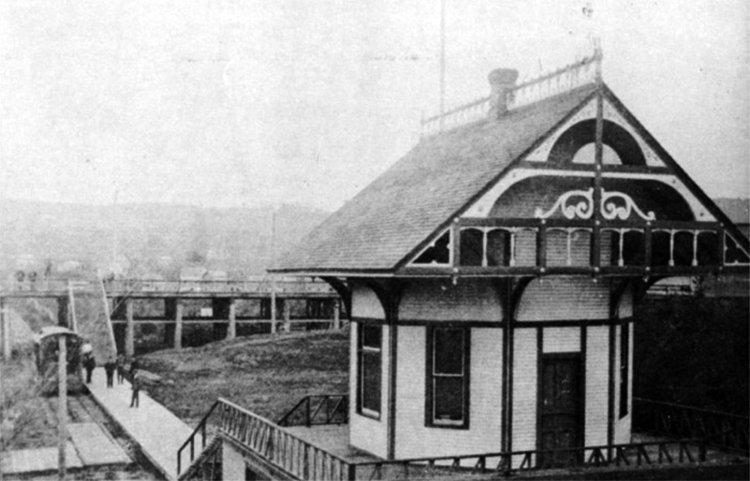 Like the Seventh Avenue West Incline, a pavilion was planned for the top of the incline in 1893, but never materialized. At first a one-car operation, the incline rose six hundred feet in elevation during the twenty-four minutes it took for the car to travel the three miles of track from the bottom to the top. 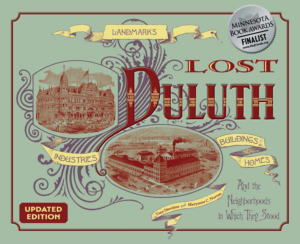 A Duluth News Tribune story on May 8, 1890 called the railway “the longest of its kind in the world.” When the railway opened for regular operation on July 8, 1890, a round trip fare cost fifteen cents. In 1892 a second car was added so like the Seventh Avenue West Incline as one car went up another came down. Bayview Heights resident W. Dibbel acted as the incline’s superintendent from the day it opened until the day he died in 1906, after which William Ives took over the job. …it reaches a beautiful plateau that overlooks West Duluth, all St. Louis Bay and much of the river, West Superior, much of Duluth, Duluth harbor, Minnesota Point and from which you can look out unto the lake as far as the eye can see. In 1902 two female passengers took an unexpected ride on the Bayview Incline, and the News Tribune reported the incident with a dramatic lead that read “Several West Duluth women were abducted on a cable car Sunday evening by a man two miles away.” Assuming the conductor was aboard the car for its final return of the day to Bayview at 9 p.m.—and unaware that several women had remained aboard the incline while they waited for a connecting streetcar—the power house operator in Bayview threw the switch, sending the car back up the hill. The women screamed, the men scrambled about uselessly, and the whole matter was straightened out in short order. Not much of an abduction, but, as the reporter wrote, “the story was too good to keep.” Later that year telephones were installed in the stations and cars. A much more serious incident occurred in 1907. Edward Burke, a 35-year-old resident of Proctor was returning home on the Incline from a day at Fairmount Park when he “in some way lost his balance.” He landed on rocks 25 feet below the raised railway and was taken by Johnson’s Ambulance to Dr. Graham’s Hospital with no broken bones but what were thought to be internal injuries. The newspaper failed to update his condition. Even worse accidents were avoided. Kids liked to play pranks, a favorite of which was greasing the incline’s rails or placing stones on the track. In 1901 two small boys placed “two or three good sized stones on the track.” Fortunately, the conductor spotted the stones and stopped, avoiding what he thought would be certain derailment. In the winter, the icy waters of Kingsbury Creek often formed ice over the cable grooves and tracks, and the incline had to be shut down in February 1904, forcing residents of West Duluth to walk to work in Proctor (then still called “Proctorknott”). In 1909 a July storm washed out a portion of the railway’s rail bed, and it wasn’t until September that year that operation resumed, in part because the owners weren’t sure they even wanted to rebuild. The same story reported that “every heavy storm causes damage and involves expenditure of large sums for repairs.” A privately owned bus company opened to take passengers from Proctor to West Duluth. Despite early success, the incline ceased operation in 1916 due to lack of ridership. Most of those who settled in Bayview Heights worked in nearby Proctor railyards and so did not require the incline’s services often enough to keep it profitable. And the advent of the automobile made public transportation less important. To this day children living in Bayview Heights attend school in Proctor. Powerlines now mark the railway’s former location.